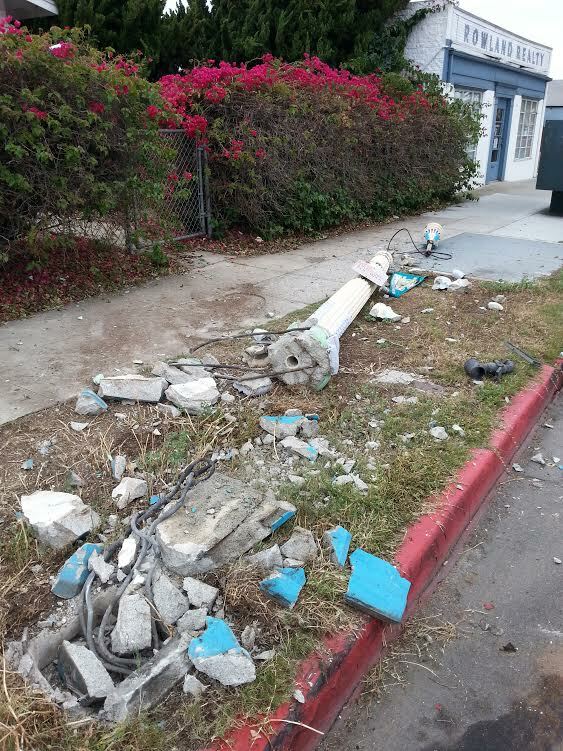 Something hit this light pole located by the OB fire station – demolishing the pole, sometime over the Memorial Day weekend. A conversion van hit this light pole by the fire station around midnight (Sunday) and fled the scene. it is leaking oil and radiator fluid and probably has a big chunk of concrete in the front bumper. So be on the lookout for a van with concrete in its bumper. Leaking oil and radiator fluid. That’s exactly what happened… I was a witness, too. I recognized the van as one that has been in the neighborhood for a few months; sometimes parked off of Hancock Street next to the ICE Company. Saw the suspected van this morning parked on 1700 block Ebers and took pictures. You can definitively tell it hit something the size and shape of a light post and it is leaking fluids. Found a police officer and he said to call Traffic Investigations. 858 495 7800.